A VICE team of two journalists is reported as detained by Turkish police in Diyarbakır. The daily Milliyet fired several journalists this week. Milliyet had a unique situation since it was sold from Doğan Group to the Demirören Group since the new boss was pro-government but the staff was not. The daily slowly started to eliminate the AKP opposing staff after the purchase and it seems this policy accelerated this week. Columnists Kadri Gürsel and Aslı Aydıntaşbaş were fired in recent weeks. On August 27 and 28, Milliyet also fired Kemal Göktaş, Evin Demirtaş and Sertaç Koç from the Ankara office alongside Semra Pelek, Mehveş Evin, Meral Tamer and Alper İzbul from the Istanbul office. Mesleğe Milliyet’te başlamıştı, o da çıkarıldı! President Erdoğan, speaking at one of his regular meetings with muhtars (local headmen) at his presidential palace in Ankara on Wednesday, complained that some circles were being tolerant to the activities of the terrorist PKK in Turkey, adding that they would face severe sanctions if they were in a European country and showing the same attitude toward a terrorist organization operating there. “If it is a media organization [giving this treatment], they would be closed down; if it is a civil society organization, their activities would be immediately halted; if it is a writer, they would find themselves first in court and then in jail. Turkey is a country where freedoms are really broad with this respect,” he said. Daily Hürriyet fired anti-AKP columnist Yalçın Doğan. The newspaper claimed the reason is economic and many other personnel were let go but it was also reported on other sources that Doğan’s political stance was the issue. Anchorman Cüneyt Özdemir tweeted that he will not be doing prime time news at Kanal D this season but continue doing his own news show. He did not elaborate on the issue but Turkey news sources guessed this was a political decision by the channel rather than a business one. Ve Cüneyt Özdemir Kanal D Ana Haber’den alındı! President Erdoğan had a column removed from news websites by court order. Columnist Mehmet Altan’s piece, ‘Can one be president by demolishing the country?’ is removed from it original source T24.com and two other websites. The 9th Istanbul Penal Court of Peace ruled that “the column’s content could not be considered within the borders of freedom of the press, freedom to express opinion, the right to inform and the right to criticize” but it “violates personal rights” of Erdoğan. Erdoğan dava açtı, mahkeme Mehmet Altan’ın yazısına erişimi engelledi! Pro-government media boss Ethem Sancak had news about him praising the president banned by a court order. Sancak has said: “While working on his campaign to get him elected prime minister, from my hometown Siirt, I met him. I saw his honesty and courage. I saw his opposition to oppression, his ability to protect the victim. The more I saw him, I feel in love [with him]. To be honest, during my days as a leftist, I could not understand the love between Mevlana [Jelaluddin Rumi, the poet] and [his companion and spiritual guide] Shams al-Tabrizi. As I got to know Erdogan, I realized that such a kind of divine love between two men is possible. When I [first] declared my love to him, I was already among the top 20 on the Forbes’ list. 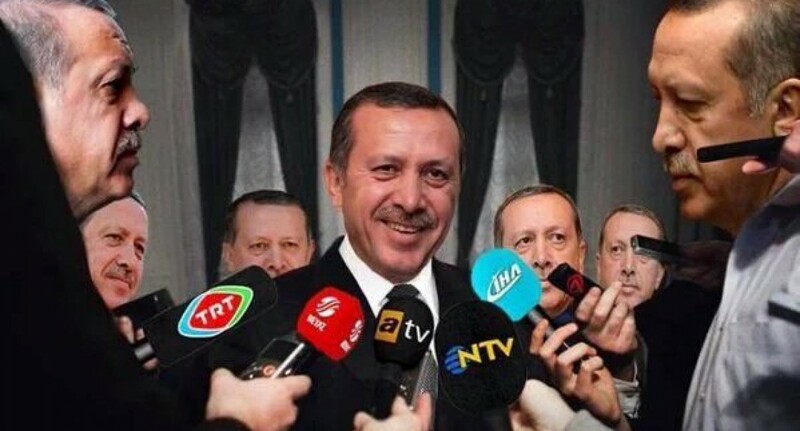 I did not need to wait for any favors by holding on to Erdogan’s coattails” in an interview back in May. However, Sancak filed a complaint about 50 news sources who reported this and had the stories removed by the order of the 8th Istanbul Penal Court of Peace. Sancak is also currently waging a war of words between his newspapers and daily Hürriyet columnist Ahmet Hakan. Sancak’s media is accusing Hakan to be a traitor and terrorism sympathizer while Hakan criticizes their extreme partisanship. The number of the recently banned news sites, their mirror sites and other “dissident websites” (pro-Kurdish and/or socialist sources) increased to 309 as internet freedom activists Yaman Akdeniz and Kemal Altıparmak made a personal application to the Constitutional Court; hoping to get the ban order of the local court revoked. The Gölbaşı Penal Court of Peace in Ankara is famous for internet ban orders in favor of the government. The Turkish Revenge Brigade (TİT), and extreme-right group, threatened the socialist daily Evrensel. The group posted a statement to the dailies’ online forum and threatened their lives; condemning them for their pro-PKK stance. Evrensel reported this; reminding that the TİT has thereatened them twice before in 2011. Star Media Group’s chief executive officer, businessman Murat Sancak, has survived an armed attack in Istanbul. Hizmet Movement’s dailies and TV channels have not received a customary invitation from Turkey’s top religious institution to participate in the Hajj with the institution’s representatives and report on the experience. News sources known to be close to the Hizmet Movement claimed that a crackdown on the dissident media is near. Another such claim was made by twitter whistleblower Fuat Avni before the elections. According to media news sources, two journalists were fired from the daily Habertürk over a story saying too much mineral water is bad for health. Journalists Hüseyin Gündoğdu and Neşet Karadağ were fired because the owner of the newspaper is also in the mineral water business; according to medyaradar. Habertürk’te maden suyu krizi! 2 gazeteci neden kovuldu? Also, this twitter dialogue from August 24 may be of reference for the pro-government media’s rhetoric these days. Dogan Group owned internet newspaper Radikal refused to publish a column by Emrah Altındiş because he made a call to President Erdoğan to send his son to do military service. Altındiş gave his column to the independent internet newspaper Diken and declared that he will continue writing his columns there. The İstanbul Chief Prosecutor’s Office has indicted 18 journalists from nine newspapers, seeking up to seven-and-a-half years in prison for publishing a photo of a prosecutor held hostage at gunpoint earlier this year. The proesecutor was killed later. The first names mentioned above are the “responsible editors” of the dailies, followed by the name of their superior. Meanwhile, Aydın Doğan and Doğan media was criticized by the pro-AKP media with allegations of defending the DHKP/C; the outlawed organization which killed the prosecutor. Doğan’s lawyers are suing the pro-AKP daily Güneş, specifically its responsible editor Mustafa Dolu for “slander.” Doğu may face up to 12 years and 6 months of jail time if found guilty.